My first prize to arrive was an Almondy Cake goody bag from Almondy Cake on twitter. 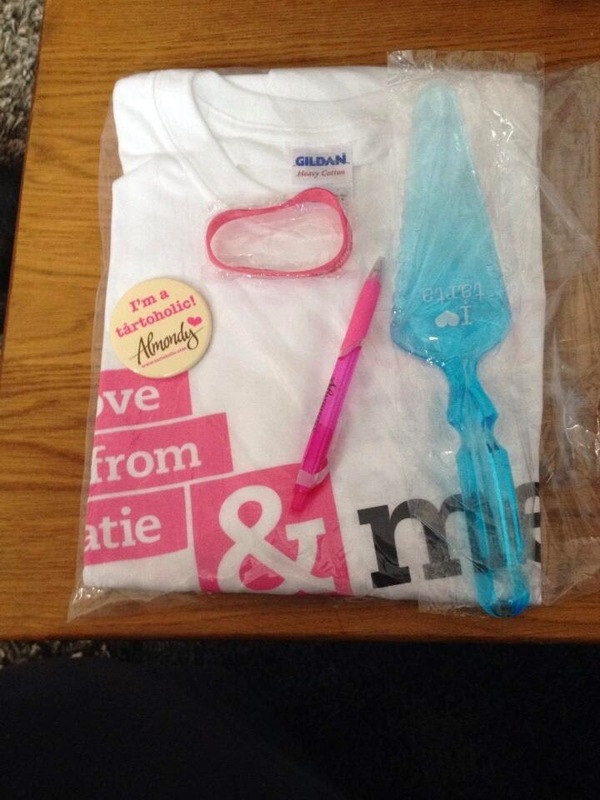 The prize consisted of a t-shirt and wristband from The Katie Piper Foundation, an Almondy pen and badge and a cake cutter/server (not sure what they are called!). I quite enjoy getting goody bags especially if they have pens in. Love a nice new pen. 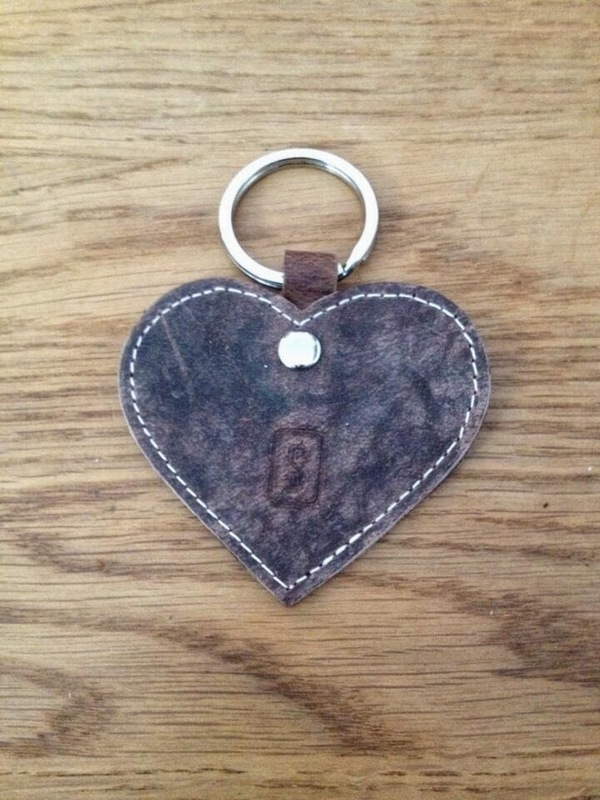 My next prize to arrive was a lovely leather heart keyring from Scaramanga. I have been looking at their online shop and they sell some really lovely items especially the home items. I love the keyring. And finally I received a copy of Love From Magazine that I won on their twitter. 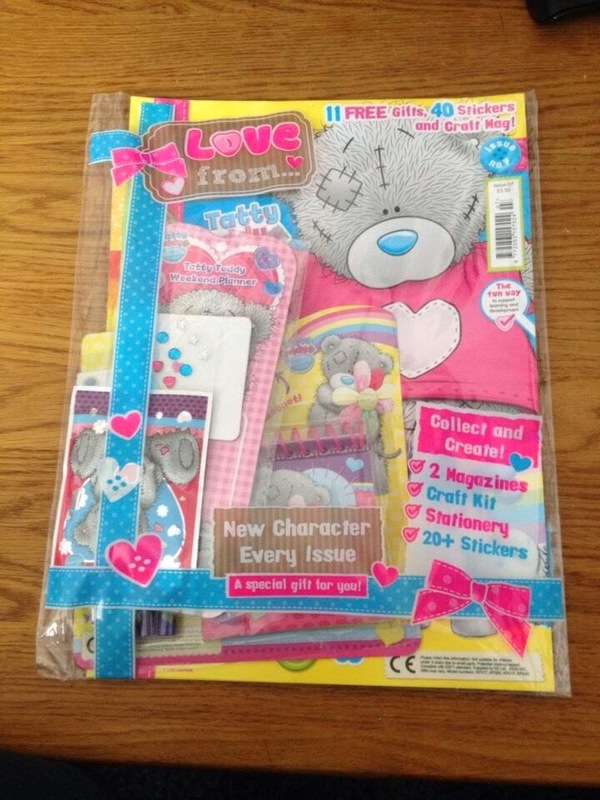 My niece is going to love the magazine and all the lovely goodies in there. 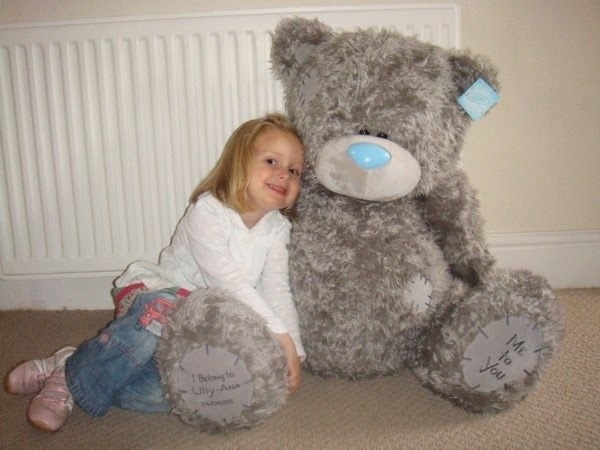 She loves Tatty teddy especially after I won her a massive personalised one (see my favourite wins post). Next time I go down home I will take the magazine with me for her. That's all the prizes I received this last week. However I did also spend some money off the £50 National Book Token voucher I won. 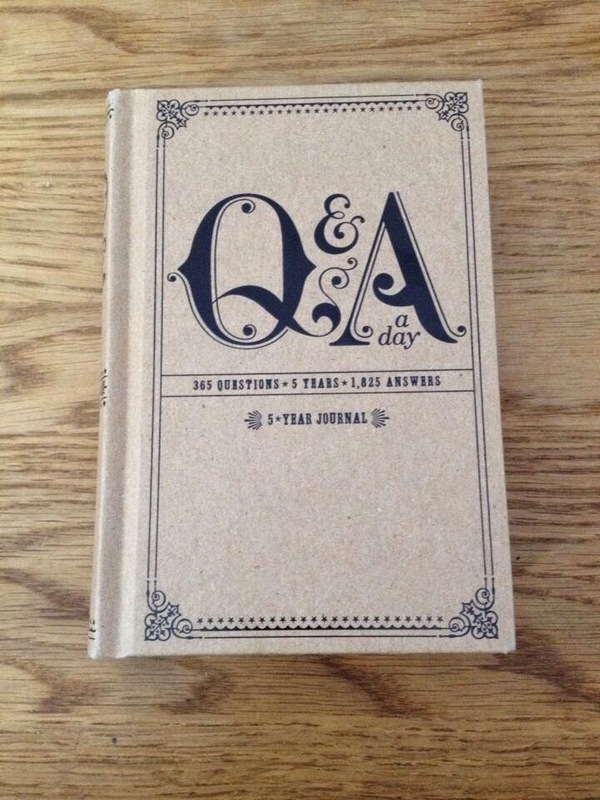 I bought this really cool book called Q&A day. It has 365 questions in and has room for you to answer the questions for 5 years. It's going to be interesting when I start it and work my way through and see how things change over the years. Just trying to decide when to start. Should I start tomorrow on the 1st of July or should I wait for the New Year? It looks really cool. 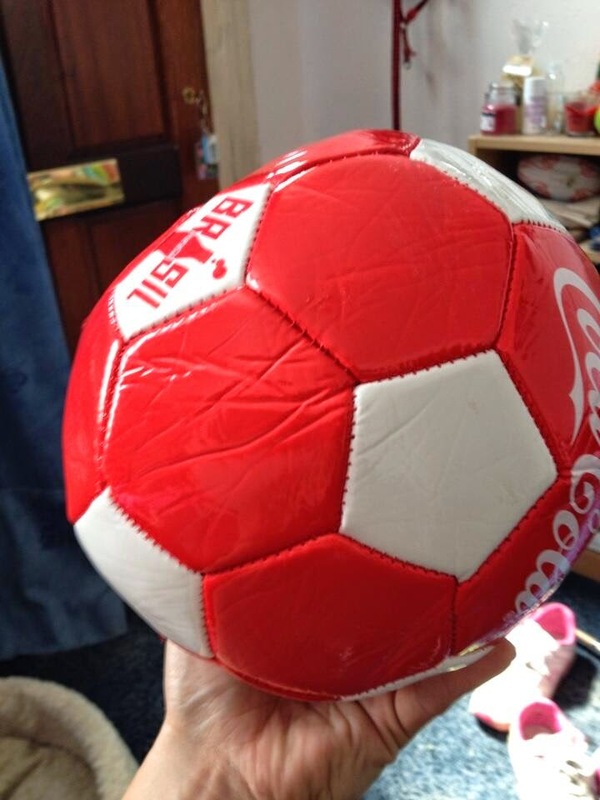 I also heard back from Coke who are sending me another football after the one I received was misshapen which is really lovely of them. Good Luck to everyone entering competitions in the coming week. Don't forget you still have time to enter my competition to win a Models Own Set of makeup. - Be Lucky. Every year around this time (and sometimes during the year too) I get stressed about my weight. I am not sure if it's because of the warmer weather and so you wear less or just the way I am. When I walk the dog to the park I go past this building where you can see your reflection in the glass and every time I go past I just look at myself and think "Yuck" and "How did I let myself get this way?" Lets go back to the beginning. When I was a child and right the way up to the age of 18 I was under weight. In fact the school even called my mum in once about it. I used to eat lots and whatever I wanted and not put on anything. When I was 18 years old I was 8 Stone. 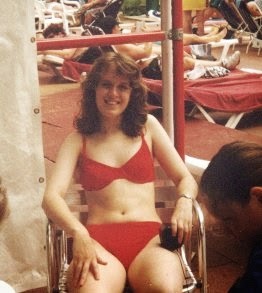 I had a lovely figure (maybe slightly too skinny) and people used to take notice of me a little. Whilst I always felt ugly mainly due to being rejected so many times in my teens by all the paper boys I fancied, I still knew my figure was pretty good. Then I got glandular fever and my world changed. It was at this point my energy levels got zapped and whilst that was 17 years ago now my energy levels have never been the same. I have days when I am so tired I have to go back to bed for a few hours. I have been to the doctors many times about my energy and they do blood tests and nothing comes up so I am stuck with this undiagnosed fatigue. Around the age of 18 I also hit rock bottom with an OCD form of depression (you can see my previous post about my battle with depression here) and was put on anti-depressants. I have been on them ever since and will be for the rest of my life. So all these things going on with my body I started to get bigger and bigger. I am now a size 24 and this summer I am the heaviest I have ever been at just over 18 stone. I really do think my metabolism has changed because I can eat around the same or less than my fiancé Neil and he doesn't put anything on but I do. So it's time to cut down on the junk food and treats. This time I have decided due to the fact I am unemployed and therefore haven't got much money to try and just cut down myself without joining Weight Watchers or whatever. In fact two years ago I joined Weight Watchers and lost a fair amount but unfortunately the lady that ran the group turned on me and shouted me down in front of everyone saying I was losing too much and that if I lost another 3lbs next week she would have to kick me out. I never went back because it really upset me. I have never heard of anyone being threatened to be kicked out of a slimming club because they were losing weight. So at the moment here is my plan. I have cut out the big bowls of cereal and gone back to porridge in the morning. I have cut down on the fizzy drinks, chocolate and other junk food. I have even started going back to eating diet ready meals in the evening (not every night though). I have lost about 6lbs in the last two weeks. I am just taking it easy really and doing it slowly. I walk the dog every day and with my friend Wendy I go walking further than I used to and faster than my normal pace so I am sure that helps. I know I am never going to be super slim again but to lose some would be good not only for my confidence but also for my health. I do notice that when I am slimmer my asthma gets a little better. The thing I find the hardest is when people come back into my life from when I was at school or in my late teens and knew the skinny me. 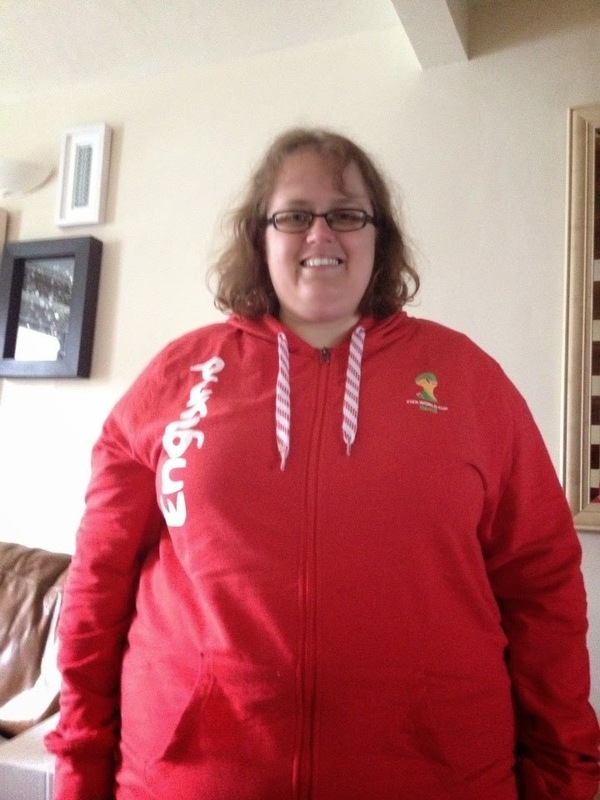 I feel so embarrassed about my weight now, they must look at me and think "what on earth happened to her?" I still have one takeaway a week for a treat. You have to have some pleasures in life. A doctor once told me that I would be on a diet for the rest of my life. Now to me that statement is so depressing. At the end of the day I want to lose the weight for me. I have a gorgeous fiancé who I love and loves me to pieces and I know inside that I am a good person. I may be overweight and I may be on anti-depressants for the rest of my life but at least I feel better mentally and have a good happy life. I guess at the end of the day you can't have everything you want but I am going to give it a try to get slimmer this summer. So here we are again. England are out of the World Cup and this time it's in the very first rounds. I must admit I never really get my hopes up any more. This World Cup there seems to have been less hype and I have noticed less flags around than usual. Maybe people don't have so much faith in England or maybe just aren't that bothered by football. Being an England fan I am used to be disappointed now. 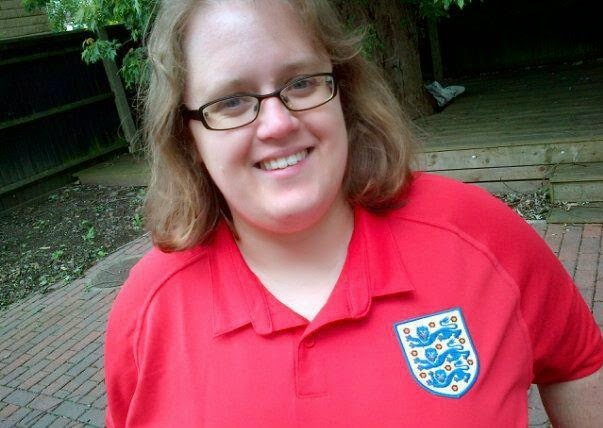 I don't watch football normally, only when England plays but I do have some pretty strong views on how I would improve football in England. 1) Stop blaming the manager for everything. I never really understood why people blame the manager whenever a team does badly. The manager doesn't even touch the football. In my view it should be the players that get the stick when they lose. It's like going into a restaurant and ordering some food that arrives and tastes vile and blaming the waiter rather than the chef. I actually quite often feel very sorry for the managers. 2) Make the football leagues more English. I hope people don't take the the wrong way as I don't mean it in a racist way but I believe to make England better at football we need to bring more of the young stars into the league to develop alongside the older players. Therefore I think the first step to do this and to give them a chance is to have a cap on foreign players. I am thinking maybe allowing two foreign players on the field at the same time per team. I feel the English players just aren't getting the chance to play in their own country. 3) Introduce a England team into the Premier League. The team would be made up of all the best players in England and week in week out they play together to gel and have a chance to become a proper team. They would play against all the other teams in the Premiership. I think part of the problem with our team is that they don't play together often enough. 4) Pay the players based on how they play. I feel that football players are on a ridiculous amount of money anyway so why not pay them a slightly reduced wage and then when they play well reward them with more money. This might take place already, like I said before I don't watch football all the time. To me it makes sense and would also make the players feel like it's worth giving it their all. 5) Stop harping on about 1966. It was amazing what the England team did in 1966 but it's a long time now and going on about it all the time doesn't really help us. If I was an English player I think I would be fed up by now of hearing about 1966. I am sure football was a lot different back in 1966. And that concludes my ideas. Some might be a bit unrealistic but maybe just maybe we might have a better team to put forward. The most important thing is to let the new talent come through. The top clubs really need to take a chance on some of the younger upcoming players so we have a lot of choice of players for the next World Cup. It's sad to see England drop out so soon especially as us fans that only watch for England have to put up with another couple of weeks of it on the tv. I started entering competitions back in 2000. Some years I have entered more competitions than others and to date I have won 1109 prizes. I often get asked the questions "What is your best win?" or "What is your favourite win?" so I thought I would share some of my favourite wins with you. Some compers (people who enter competitions) work out the value of their prizes over a certain time period. but I have never done this. 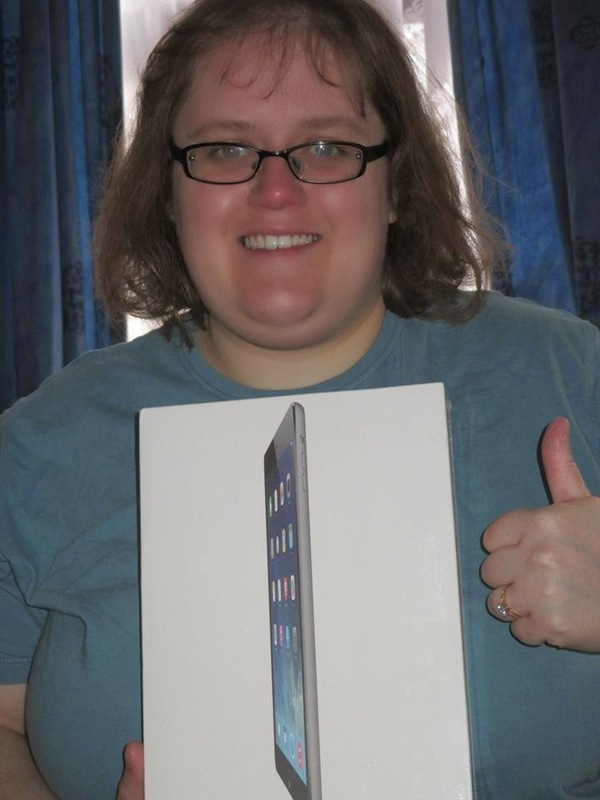 The best prize I have won money wise is £1000 Love2Shop vouchers which I shared with my family and bought myself an iPod Touch and Digital camera. I would love to win a huge sum of money but some of my smaller prizes have made me smile a lot especially if they have made other members of my family happy. In 2009 I won this huge Me To You bear. There was 100 to be won and they had over 20,000 entries and I was picked as one of the lucky winners. The prize was a launch bear for their new personalised range. When I won I thought it would be a small bear and when it arrived I was so amazed by the size. As soon as I won it I knew it was going to go to my niece Lilly. She was nearly 4 at the time and it took me awhile to decide what to have written on his foot and in the end I thought it would be nice to have "I belong to Lilly-Ana" and her date of birth. Lilly loved him so much that for the first day or so my sister had to lug him around everywhere to show people. Big Bear still sits in Lilly's bedroom to this day though he now wears one of my sisters stretched t-shirts. In 2011 I started entering competitions on twitter and one of the prizes was to win £500 cash with Best Western Hotels. Each day they gave a clue to where the hidden golden key was and if you were near it you could go and try and find it. The first person to find it won the cash. 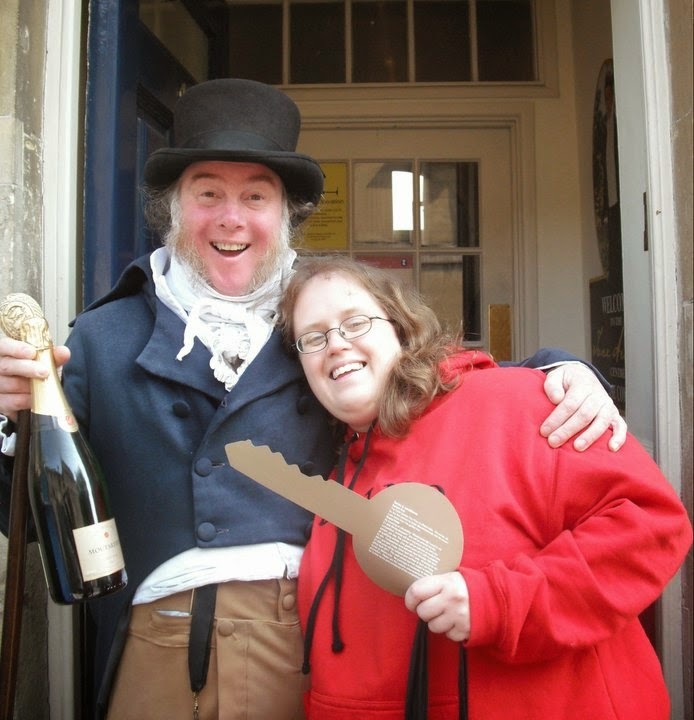 When the clue came up I knew exactly where it would be at the Jane Austen Museum in Bath (where I lived at the time). So I rang mum up and asked her to drive me over there as it would have taken too long to walk as someone would get there first. She came straight down and picked me up and dropped me off at the Jane Austen Museum and went to find somewhere to park. The man in costume outside the museum knew I was looking for the key but wasn't allowed to tell me where it was. I looked around and then I thought maybe it was behind the door which was pinned open at the time. The man said "she who dares wins" so I looked and there it was, the golden key. I took it with me and won the cash. I gave half of the money to my mum for driving me there and I returned back to see the lovely man outside the museum and gave him a bottle of champagne. 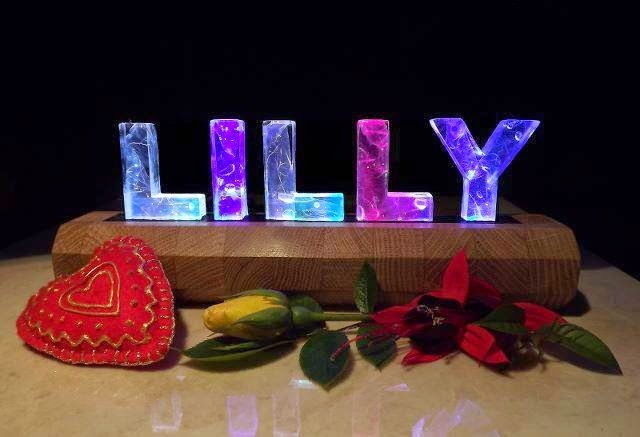 Another favourite prize was Lilly's name in lights. I won this in 2012 on twitter. It's so lovely and lights up in all different colours. I love unique prizes. For me the prizes I most like to win for myself are gadgets. In the last year and a half I have been very lucky to win three Kindle Fires and 2 iPads as well as a printer and digital camera. I have kept one of the Kindle Fires and gave the rest to members of my family. One thing I like to do every so often is give back to people who love to enter competitions and now with my new blog I am hoping to be able to give more prizes away. So as I received four lots of Models Own makeup last week I thought it would be nice to give two away to my readers. The first person picked at random via the Rafflecopter will win the pink set (Blooming pink nail polish, pink lip-stix and black lashed-up volumiser mascara) and the second winner will receive the peach set (Golden peach nail polish, peach lip-stix and black lashed-up volumiser mascara). To enter the competition simply complete as many of the steps as you wish on the Rafflecopter form below. Winners will be chosen at random at the end of the competition. This competition is open to residents of the UK only. Good Luck. This week was quite a quiet week on the competition wins front. I had one big win and three little wins. 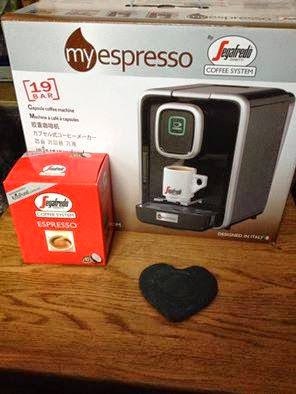 The first thing to arrive was this lovely Myespresso coffee machine and coffee pods from Segafredo on twitter. The coffee machine is great and I look forward to trying all the different flavour pods you can get for it. 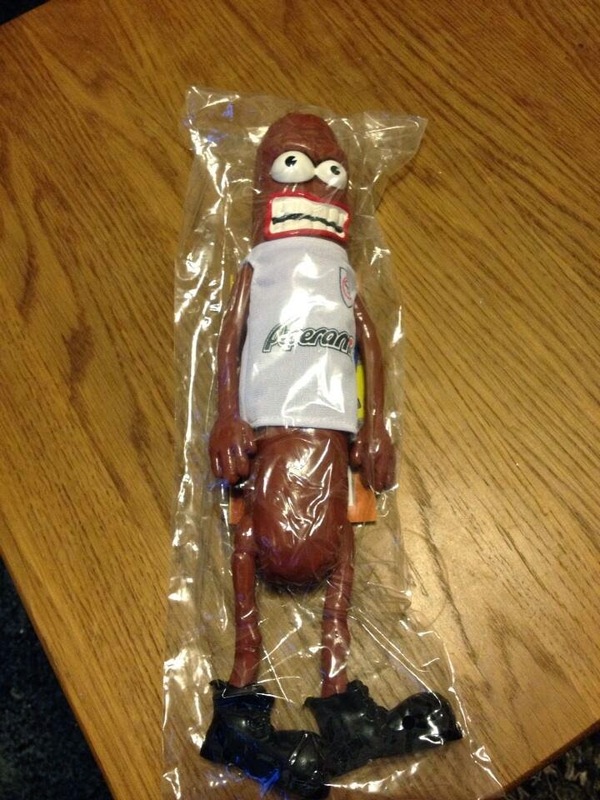 Then my Fanimal arrived from Peperami. I don't often do text competitions but this is one I had to do and as they are giving so many away there is a really good chance of winning one. I love these talking mascots, they are pretty ugly though. I still have the ones I won from 8 years and 4 years ago. They are so funny. I am so glad I got one to add to my collection. I still think the first one is the best from 8 years ago with the saying "My Nan's harder than that and she is pork pate". If you want to enter there is more info on how to enter in the terms and conditions here. They are giving 1000 Fanimals away every day until 30th June. 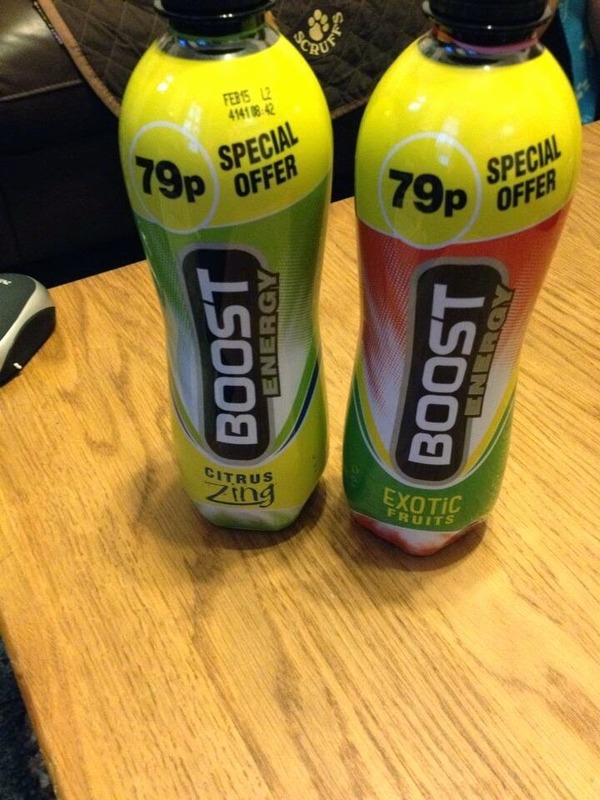 Next I received two bottles of Boost energy drink. I won these on an instant win competition. My fiancé Neil will like these. I won't be drinking them especially as they contain 55g of sugar in each bottle but then that's because they are energy drinks. I won two different flavours Citrus Zing and Exotic Fruits. And finally I received a lovely bottle of red wine from Just Great Wine. 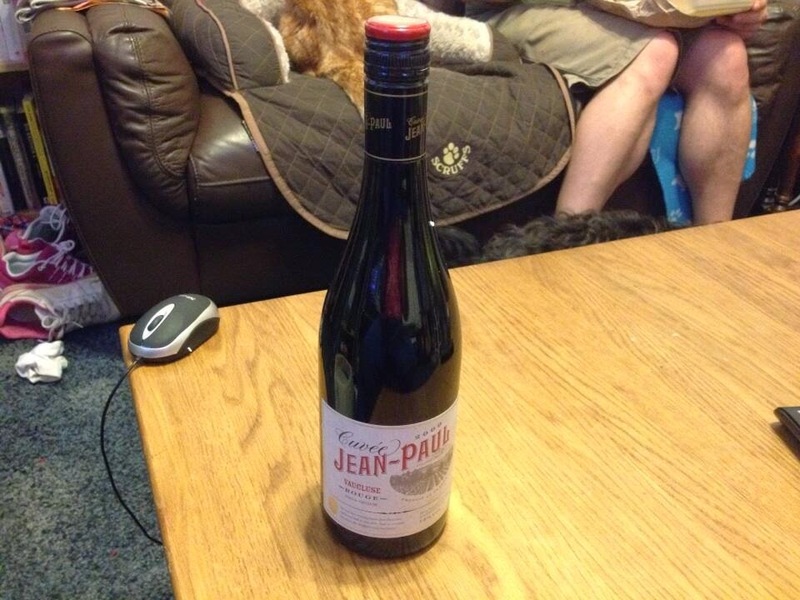 They sent me a bottle of Cuvee Jean-Paul wine. It looks fab. Sadly I don't drink wine as I can't stand the taste but this one is for Neil. He loves wine so he will enjoy a glass or two with a nice meal. Why not leave me a comment below and tell me what you won this week. Good Luck to everyone entering competitions. Hope you win some great prizes in the coming week. 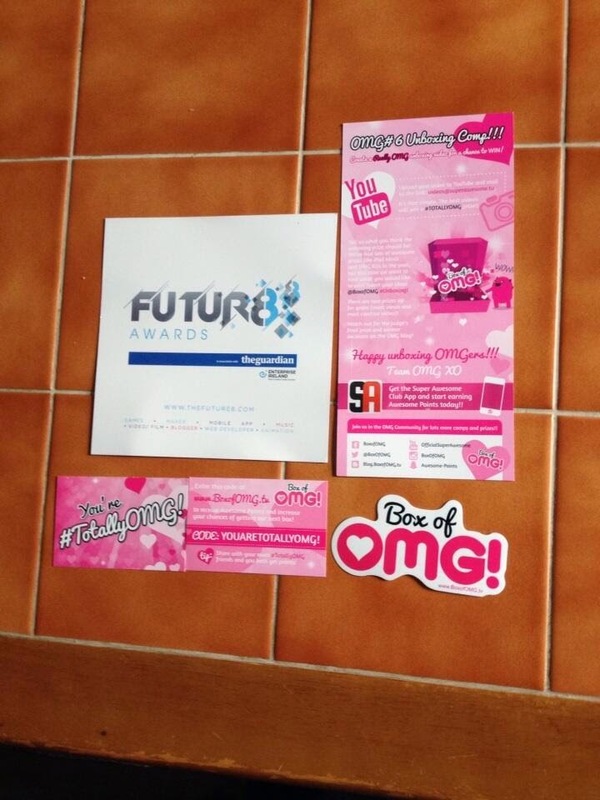 Don't forget my Mega Box of OMG competition is still open. And coming up I have a competition to win some Models Own make up. 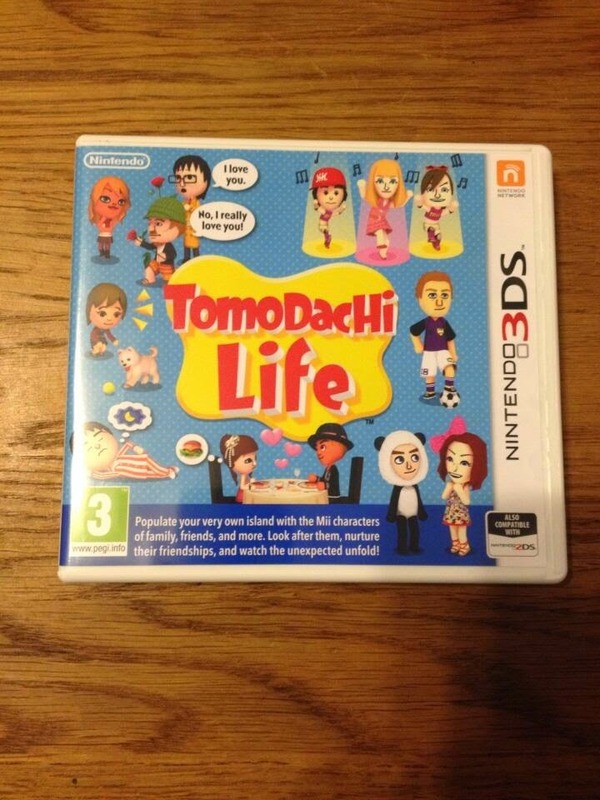 About a month ago I saw a video trailer for a new game that came out in the UK last Friday called Tomodachi Life. As soon as I saw the video I knew it was a game I would be interested in buying. So last weekend I bought it and it's such a brilliant funny game I felt I had to write about it. 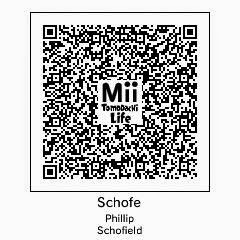 Tomodachi Life reminds me a little bit of The Sims and Animal Crossing but it is a lot more funnier. Basically you get to create your own Mii's (people) in the game and you can create whoever you want to include. 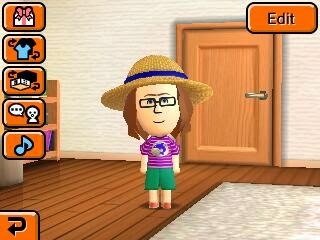 At the moment I have about 25 Mii's in the game with a lot more rooms in my apartment block to add more. 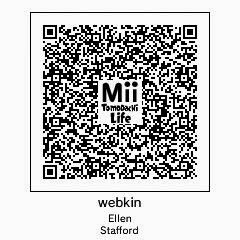 Here is my Mii and also the QR code so that if you have the game you can scan it in and add me to your game. 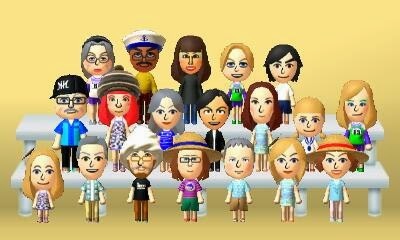 In my game I have created Mii's of family members, friends and even celebrities. 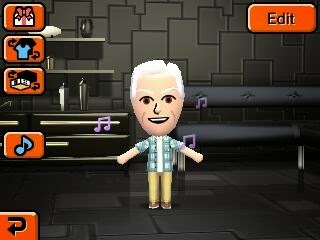 For example here is my version of Phillip Schofield (it's very hard to get it perfect as there are limitations on facial expressions and in particular I find there aren't quite enough hairstyles or colours. However the colours issue is solved when you get given hairspray in the game to spray the Mii's hair any colour of your choice). So once you have your Mii's set up they go about their daily life and as they level up you get to unlock more things for them including songs and items for their rooms. Each day, twice a day there is a news bulletin about what your islanders have been getting up to and it's a little video of one of your Mii's reading the news like it would be on television. You get to play games with your Mii's like guess the picture or match two. You also get to feed them and buy them food, clothes, hats and new designs for their apartment. Unlike The Sims though they don't continually nag you if they are hungry. They may just say now and again they are hungry to feed them but not all the time. All the Mii's interact with each other so they might ask you to help them make friends with someone or you might visit one apartment and three Mii's might be in there talking or playing games etc. For me the most fun part of the game is seeing who ends up with who romantically. So far I have a few people dating but I haven't had my first wedding in the game yet and I know when this happens even more unlocks so I am very much looking forward to seeing who marries who. The romance element makes it so much fun but there are also sad moments too for example my Phillip Schofield Mii asked my Mii out on a date (oh to be so lucky hehe) but then Neil's (my fiance) Mii came firing in and claimed he loved me more and so my Mii decided to date him instead and it made Phillip very sad but I cheered him up in the end by sending him on holiday to Hawaii. 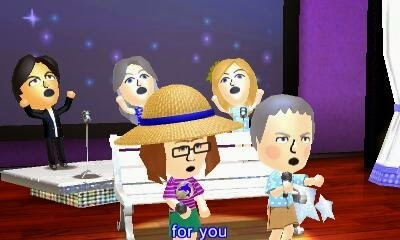 And another very funny part of the game is when you put your Mii's on stage for a sing along together. I have had some real laugh out loud moments on my game. The thing about this game is it's so addictive. I can sit down with my 3DS to play it for a few minutes and then look up an hour later and still be playing. There is so much to do and so much to unlock and so many funny situations. And another great thing is that in the game you can take photos at any point and share them on social media too. So as the story is unfolding I am posting pictures and tagging in friends and family and making them laugh a lot too. It's just a real fun game. If you like The Sims or Animal Crossing you will totally love this game. 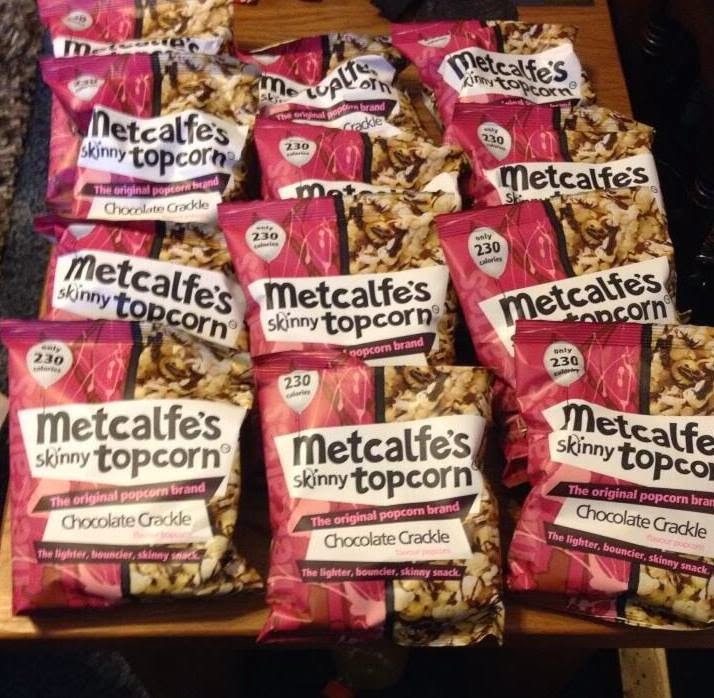 Firstly on the 4th June I received a box of 12 packs of Metcalfe's Skinny Topcorn Chocolate Crackle from Metcalfe's Skinny. I also won a signed book to go with it but it hasn't arrived yet so I will put that up when it arrives. The popcorn is so lovely though with just the right amount of chocolate drizzled on the top and with only 230 calories in the bag it's a really nice treat. 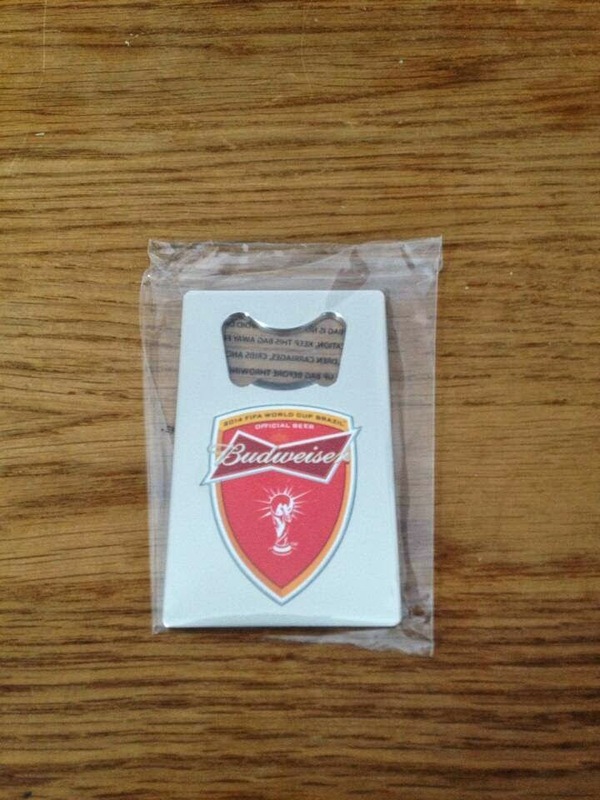 Next I won a Budweiser Bottle opener from the Budweiser app on my iPhone. It's a really nice quality bottle opener. I have won a couple of these now. If you go on your iPhone and search the app store for Budweiser, it's a free app...then you need to hold it up to a bottle of Budweiser of an image of the logo and it comes up instantly to tell you if you have won. It works very much like Blippar but is in it's own app instead. 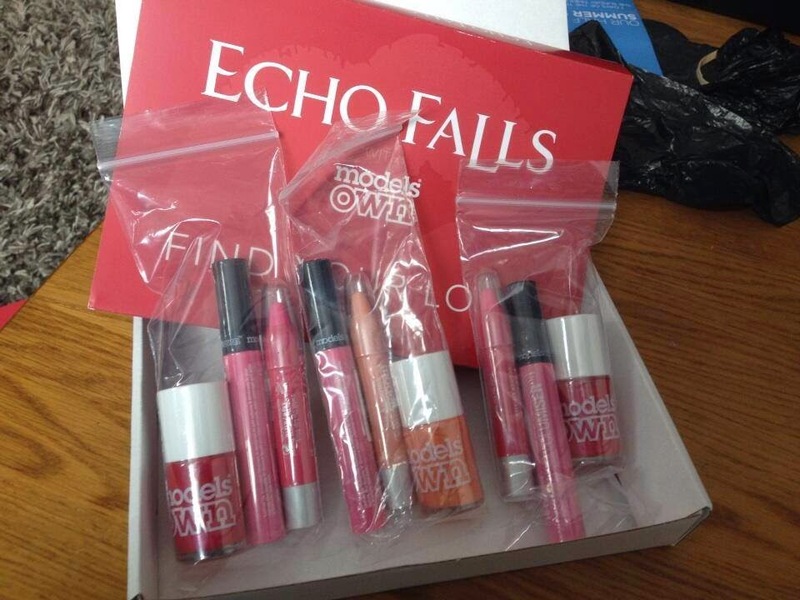 This week I also received the Models Own make up sets that I won from Echo Falls instant win app on Facebook I actually only won twice but they sent me four lots (three pictured). A lot of other compers have received more than they won too. My sister is going to be very happy with some of these. 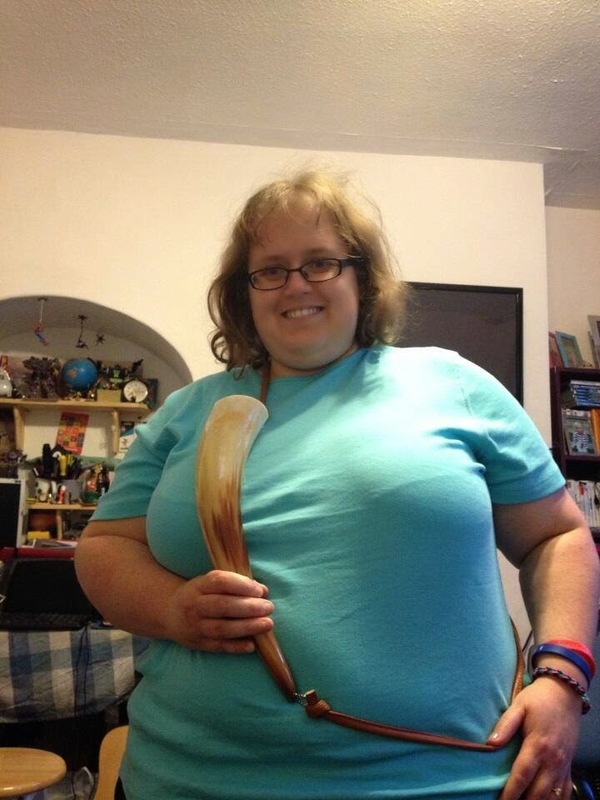 I also received the Hobgoblin drinking horn that I won from Hobgoblin's page. Again an instant win for voting for a band to perform at Bloodstock 2014. When I won this I thought if you fill a horn up with beer or whatever what happens when you want to put it down because it won't stand up like a glass. When my horn arrived it came with a strap you put around you. Problem solved. It's a really cool horn. (I look awful in this picture though hehe). 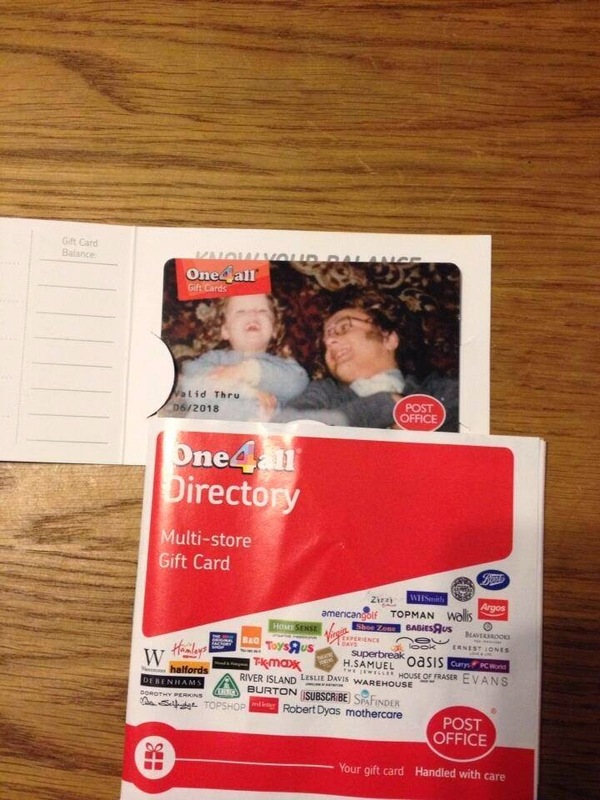 And lastly I won a £25 One4All Gift card from @One4AllGiftUK on twitter. For the competition you had to tweet them a picture of you with your Dad. So I chose to send an oldie of me when I was two or three with my dad giggling on the floor. Little did I know that they would personalise the card with the picture on which is a really nice touch and was a lovely surprise. 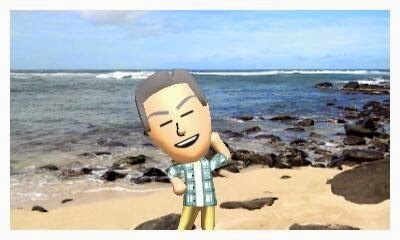 And finally I decided to spend some of my £50 John Lewis voucher I won last year on this fab new 3DS game called Tomodachi Life. More info on the game coming up in a blog post soon. Good Luck to everyone who decides to enter some competitions this week. Remember you have got to be in it to win it. Don't give up. Your time will come! Back in September last year I was introduced by a friend to the Box of OMG! website. A box of OMG! is a box of goodies for girls that is delivered to you by post. There are two types of boxes. A standard box which you get free if you are randomly picked to receive one or build your points up on the website. Or the Mega Box which you get if you subscribe for £4.99 a box or you may get awarded one for doing unboxing videos which is how I got one. I get the box each time to share out amongst my nieces. My niece Lilly also receives a box herself and enjoys doing videos too. 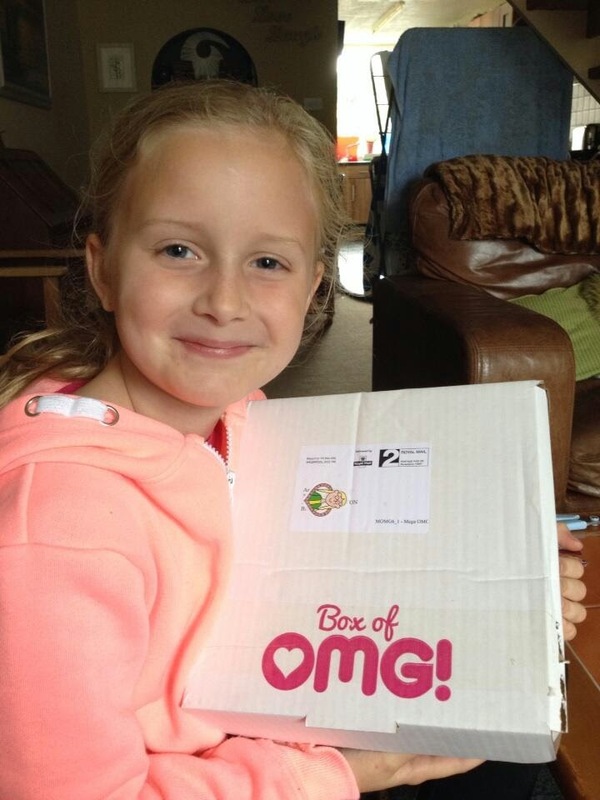 Lilly and her Mega Box of OMG! 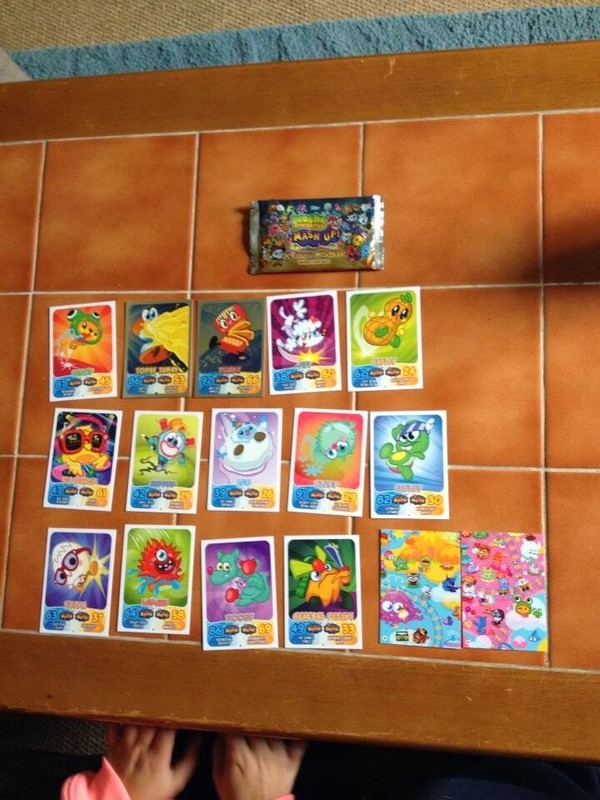 So lets have a look at the contents inside our Mega Box of OMG! #6. First of all in every box you get information about the Box of OMG! and how you can enter your unboxing video into their competition to win a great prize. You also get a card with a code on. Once signed up and logged into the Box of OMG! website you can enter the code in and receive 20 points, the more points you have the more chance you have of getting a free box. You can use this code on the website now: YOUARETOTALLYOMG! 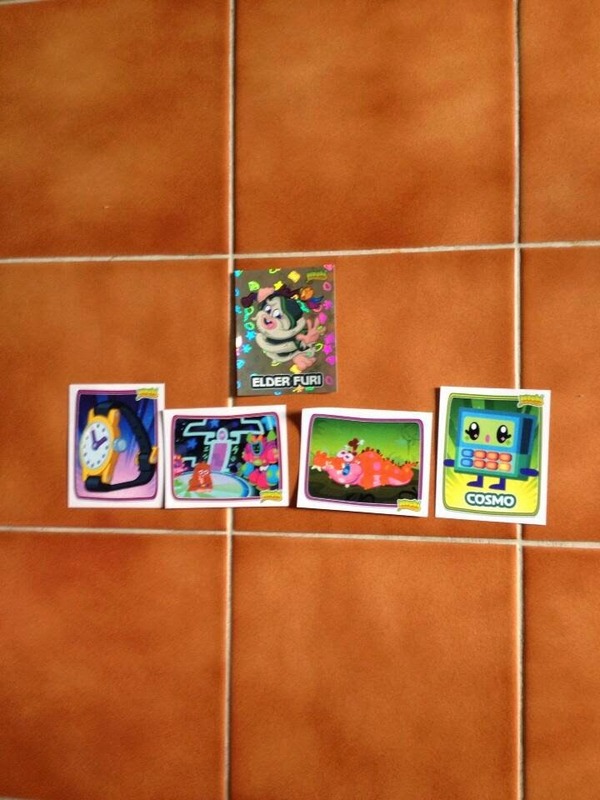 Next up we had two packs of Moshi Monsters Mashup Trading cards and one pack of Moshi Monster stickers. Both are very popular in my family. My niece Lilly collects all the Moshlings so it was fun opening these and telling me which ones she had and didn't have in her collection. 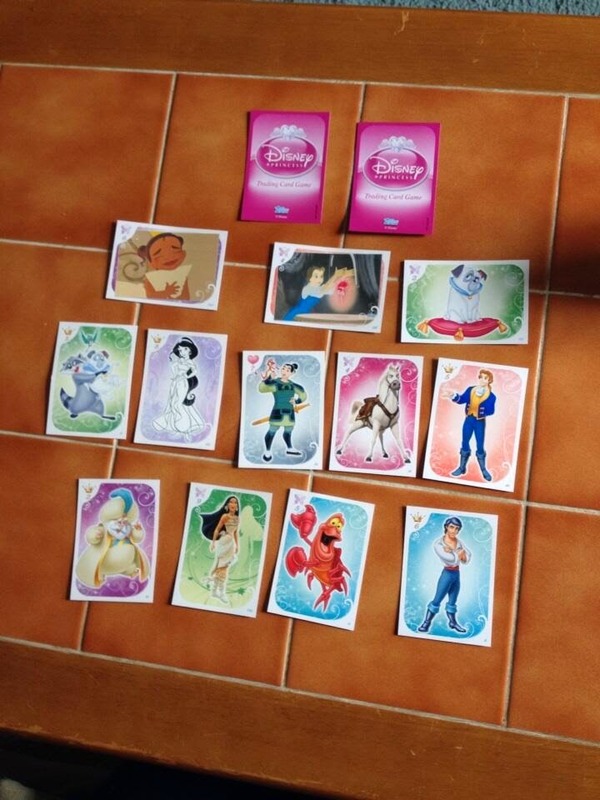 We also had two packs of Disney Princess Trading Cards. My younger nieces will love these as they love all the Disney movies and often dress up as Princesses. 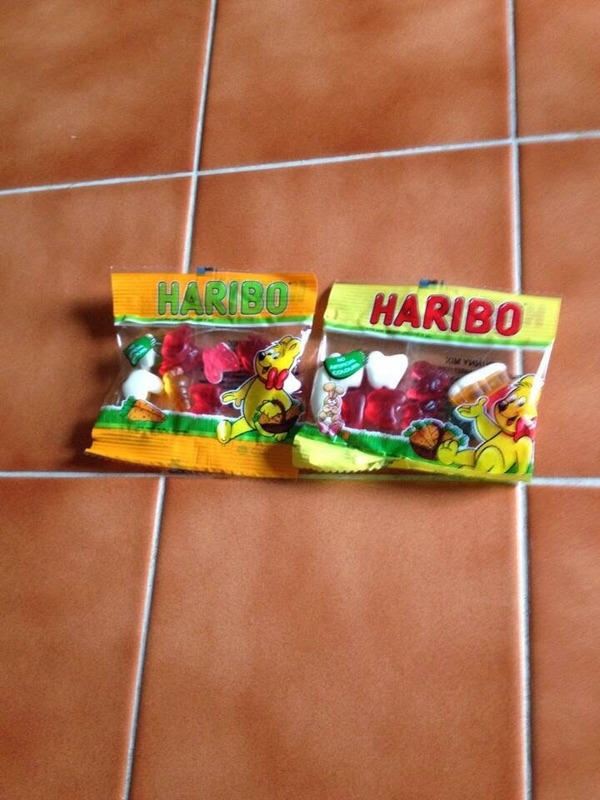 Also in the box was two packs of Haribo which everyone loves including myself. And finally in the box we had a book sampler of "Flora & Ulysses" by Kate DiCamillo which is a Box of OMG! exclusive which is great as my niece can read the first part and see what she thinks before going out and buying the book. Also there was some stickers to go with the book. 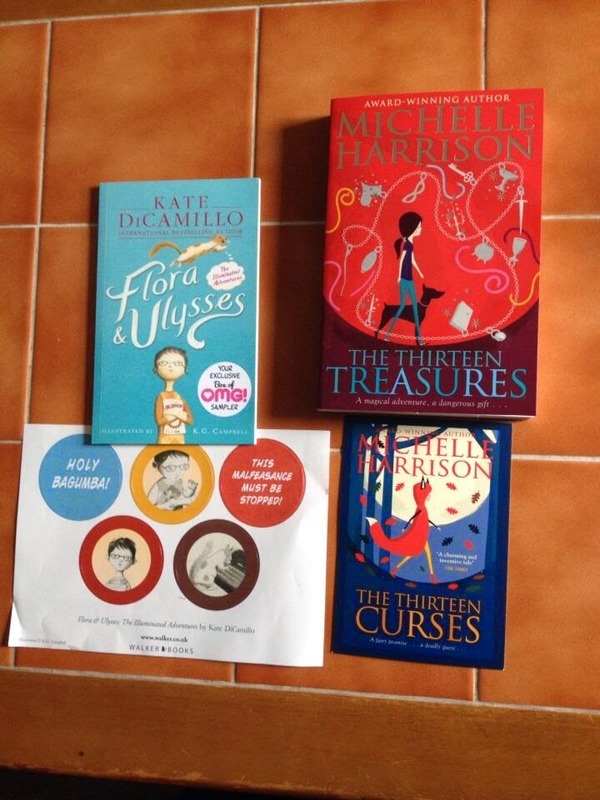 Also in the box there was a book called "The Thirteen Treasures" by Michelle Harrison. My niece is really looking forward to reading this one. The book is priced at £6.99 in the shops. The book came with a postcard too. 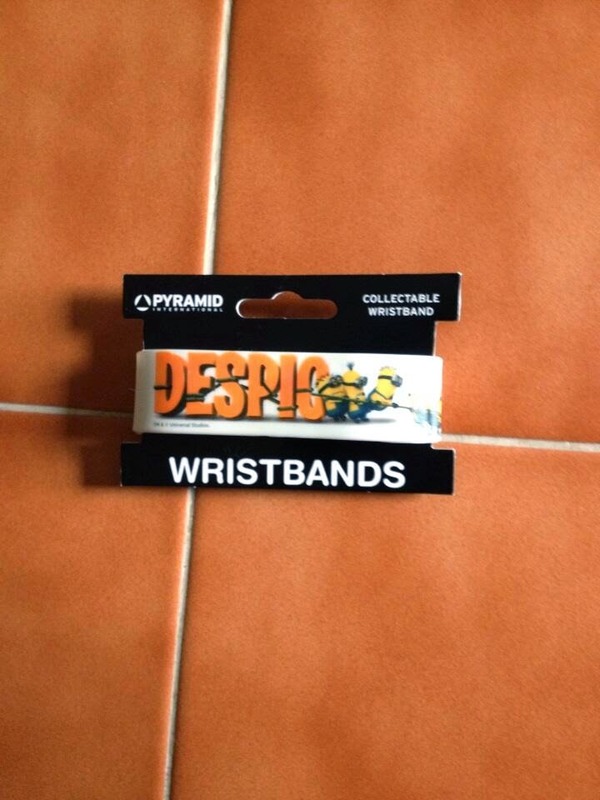 And also in the box was a Despicable Me 2 wrist band. These are collectible bands as I have received the Spiderman one in a Box of Awesome (the boys box). I think for £4.99 the Mega Box of OMG! is worth it considering what you get inside is worth nearer £10. 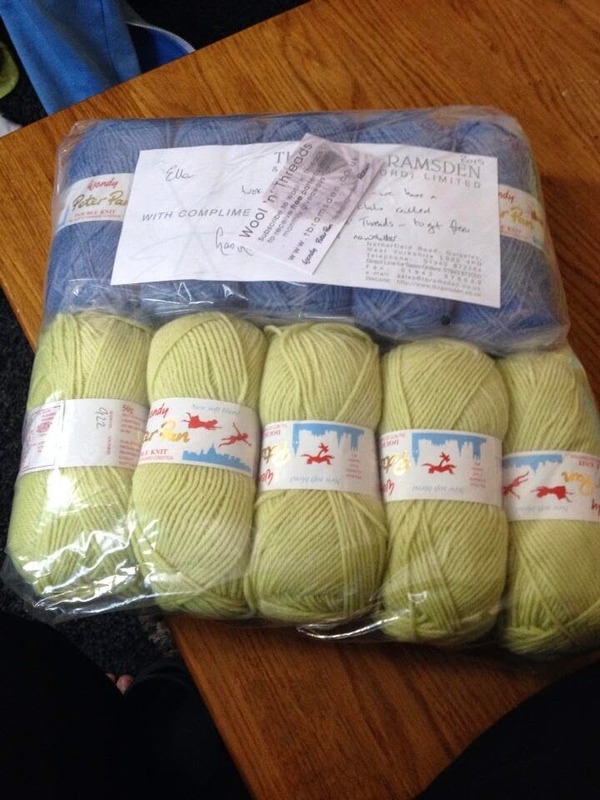 I think it's a great idea for children as it comes through the post and is a lovely box of surprise goodies. I know my niece always looks forward to receiving hers and opening it to see what is inside. You can also check out mine and Lilly's unboxing videos on our youtube channel. Box of OMG! have kindly given me a Mega Box of OMG! to give away to one of my readers. (Note: The contents may be different to what's inside my box). To enter the competition simply complete as many of the steps as you wish on the Rafflecopter form below. A winner will be chosen at random at the end of the competition. This competition is open to residents of the UK only. Good Luck. When having a pet they become part of the family. I have a dog called Shortie and two cats called Tigger and Harvey. 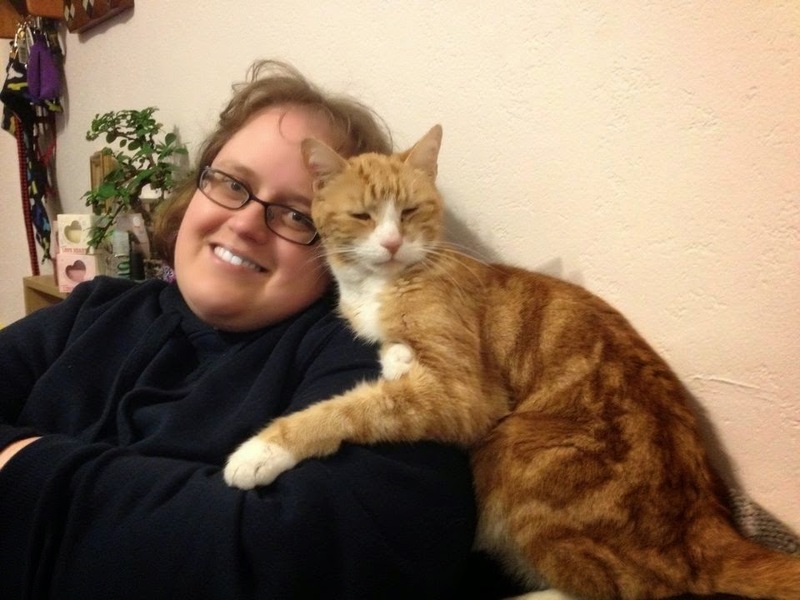 I recently found out that I was very wise to get pet insurance for them as Tigger has become ill with an ongoing over active thyroid problem. There has been many a times in the past where I have thought about cancelling my insurance but I am so glad I didn't. I have had Tigger since he was 8 weeks old. He is now 13 years old. In the last year I have noticed that he has lost a lot of weight. I thought this was because he is getting on a bit but when I took him to the vets for his yearly booster jab I told them about it and they had a feel around and said they think it could be an over active thyroid. First thing they needed to do was to take a blood test which would cost over £80 to test to see if this was the case. So they took the blood and it came back that yes he does have the condition and now he would need to take a tablet twice a day for the rest of his life. The tablets cost over £25 a month. 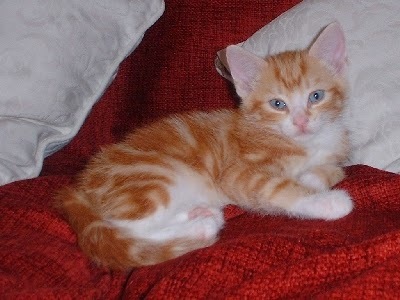 Tigger aged 8 weeks old. I started Tigger off on the tablets and then three weeks later he had to go back to the vets to have another blood test to see if he was on the right dose. Again this would be another £80 or so. Luckily it came back he was on the right dose so he didn't need to be changed. I have now claimed on the pet insurance who will pay out for his tests and tablets (minus the excess of £60). This is a huge help to our family. I pay around £13 a month on insurance for Tigger and this covers him for any further tests he may need and for any other conditions that may come about during his old age. Another example of where I used pet insurance was when my previous dog Sam swallowed a slug pellet from a neighbours garden which is very dangerous for dogs. He needed to be taken to the vets to have his stomach pumped, he had to stay over night and then had to be tested for kidney/liver failure. Luckily he was fine but it would have cost around £800 but thanks to pet insurance we only had to pay £75. I think it was a good job I got the pet insurance in place for all my pets at an early age as you never know when they are going to need veterinary care and it isn't cheap. 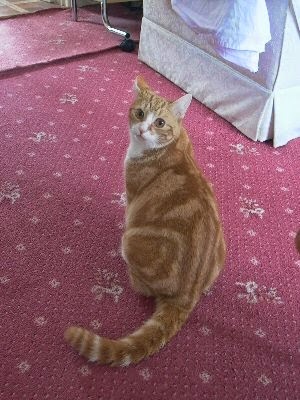 Our Tigger aged 13, happy and on the mend. Last week I was on holiday visiting my family so I didn't get a chance to do my wins of the week so this is my wins from the last two weeks. 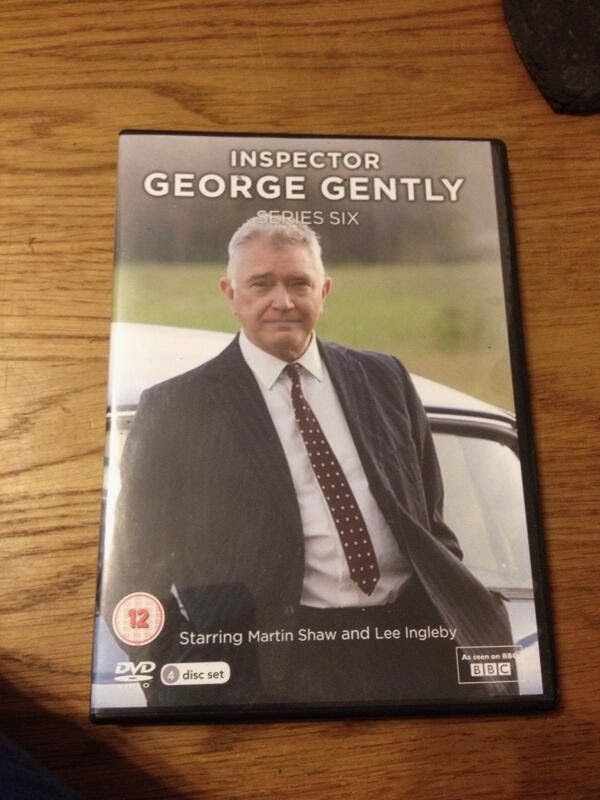 On Tuesday 20th May I received a Inspector George Gently Series 6 DVD. It was a surprise win as I didn't know I had won it but it turned up in the post. On the back of the jiffy bag it said "The People", so I looked online and found out I entered to win it from The People newspaper so I presume that is where it came from. My mum likes Martin Shaw a lot so I expect I will give her this DVD. 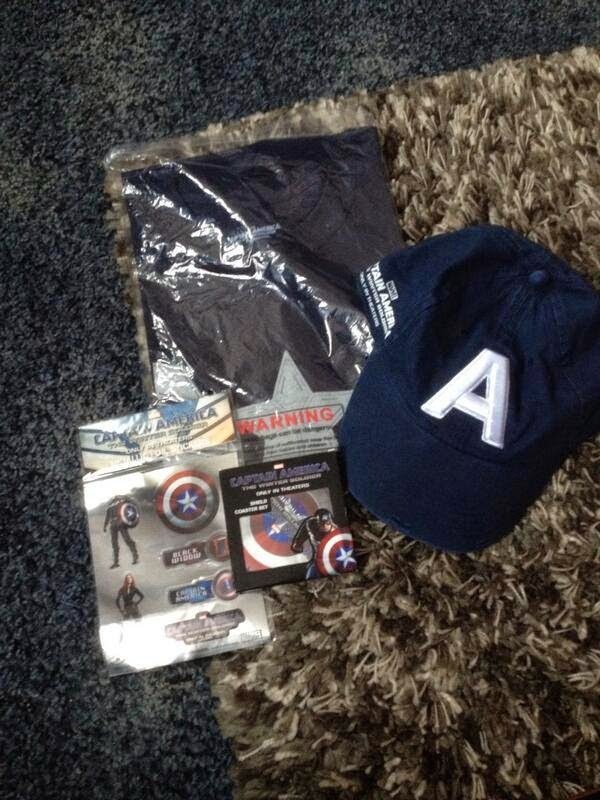 On Thursday 22nd May I received a Captain America Goody bag which I won from The Hollywood News. The goody bag contained a t-shirt, a cap, some stickers and some coasters. 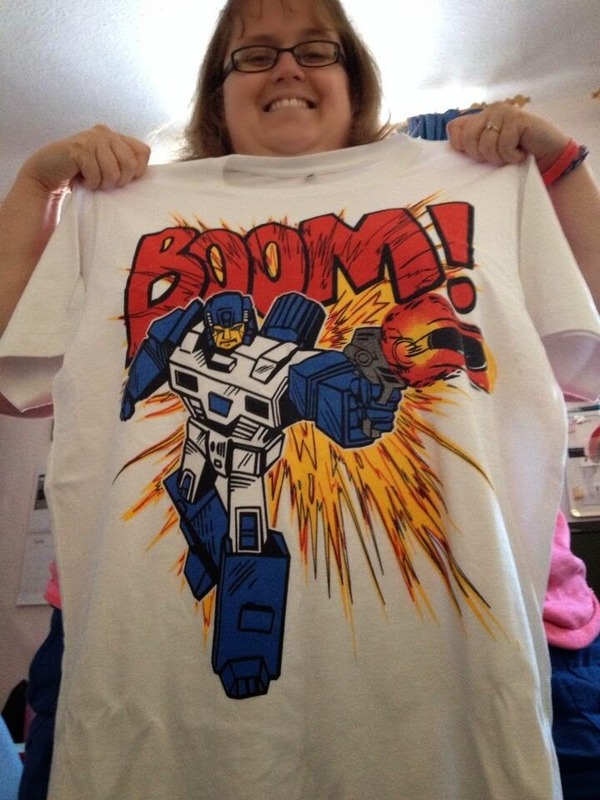 My fiancé Neil is a big fan of Marvel so he was really pleased with these especially the t-shirt and the cap. 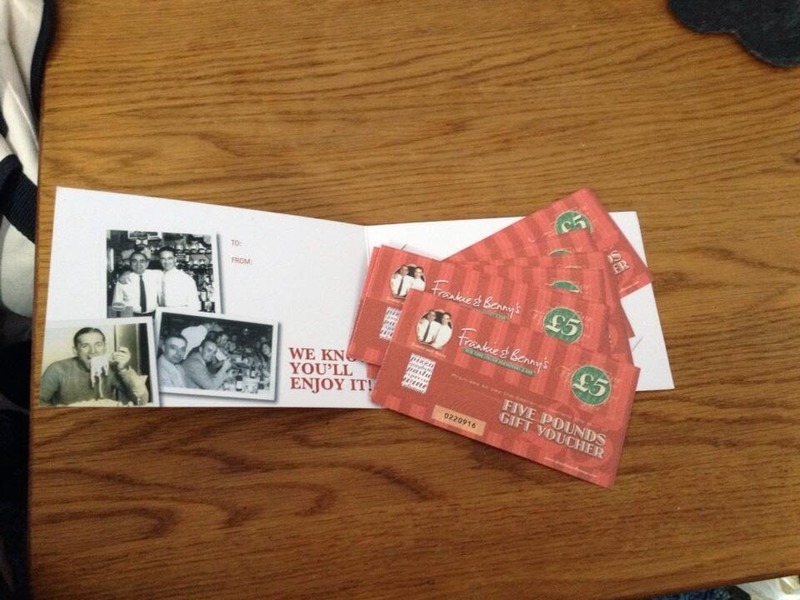 Whilst I was away I received a £60 Frankie & Bennys voucher that I won from the Munch Bunch Facebook page. I am really pleased they have arrived. I have never been to a Frankie & Bennys before but they sound great. I am hoping to spend it on a nice meal for Neil and I to celebrate our 5th anniversary of dating each other in August. Next up was a little win. A Budweiser Coolie. 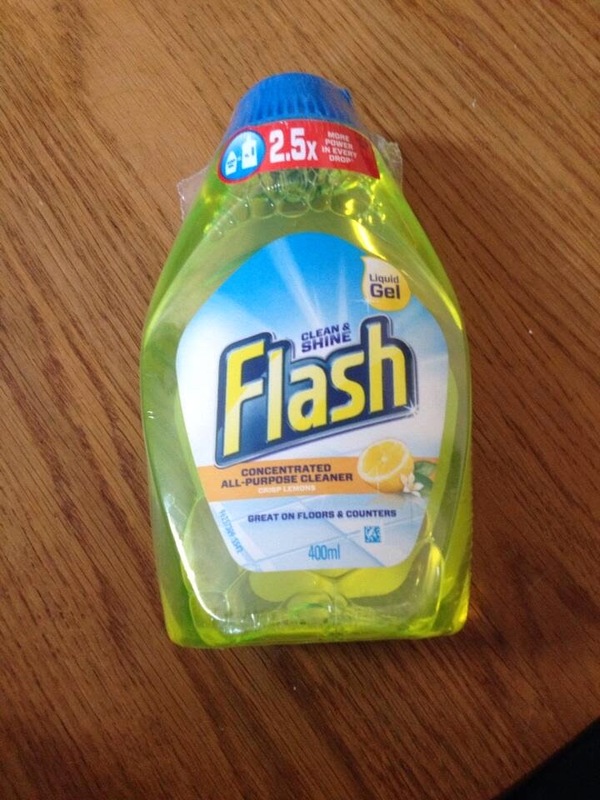 I won this from an app game you can play on the iPhone. You scan a picture of the Budweiser logo with the app and it tells you if you have won instantly. You also collect country flags to unlock winning other prizes. It's a daily competition. 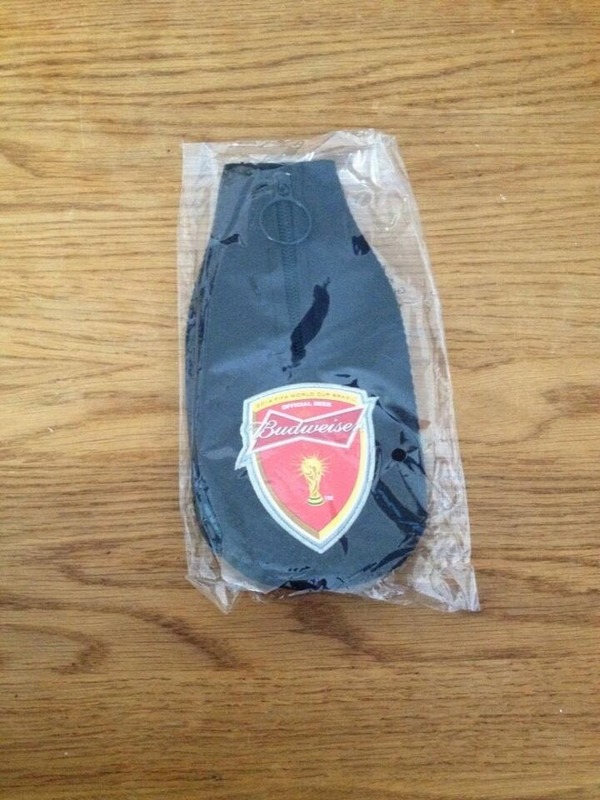 I have also won a Budweiser bottle opener which I am waiting to arrive. 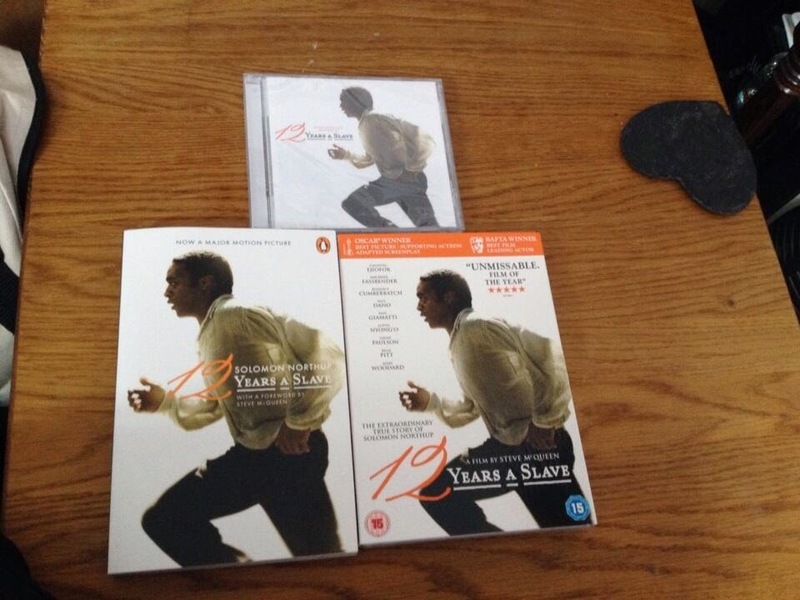 Then I received a copy of 12 Years A Slave on dvd, a book and soundtrack. I won these from HMV. I have never seen this film but I know it's good and has won lots of awards. I am not sure whether to read the book first and then watch the film or the other way around. Sometimes it's good to read a book first but other times it's better to read afterwards as you can visualise the characters better. I am looking forward to seeing it. 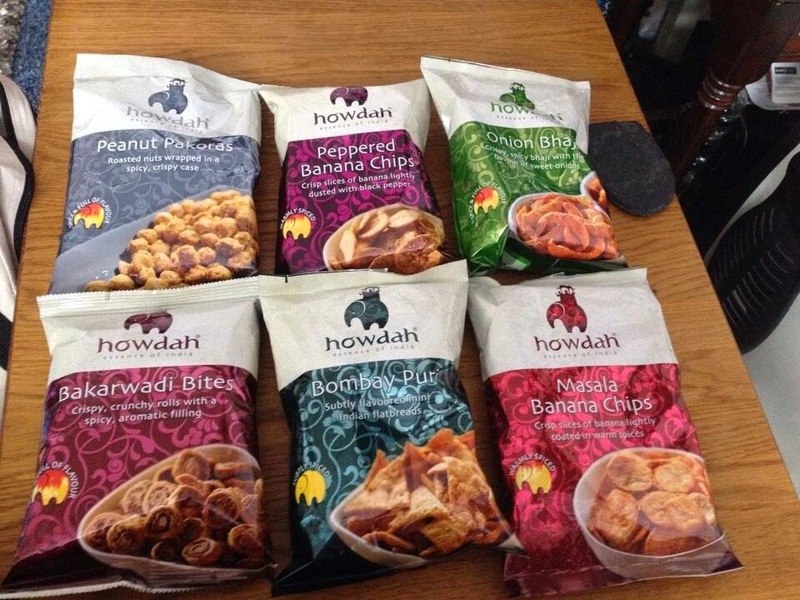 Next I received some Howdah Food Indian snacks. I won these on their twitter page @HowdahFood. The snacks are Peanut Pakoras, Peppered Banana Chips, Onion Bhajis, Bakaradi Bites, Bombay Puri and Masala Banana Chips. These look lovely. I haven't managed to try them yet as I only got back today but I look forward to it. I know Neil is going to love these a lot. 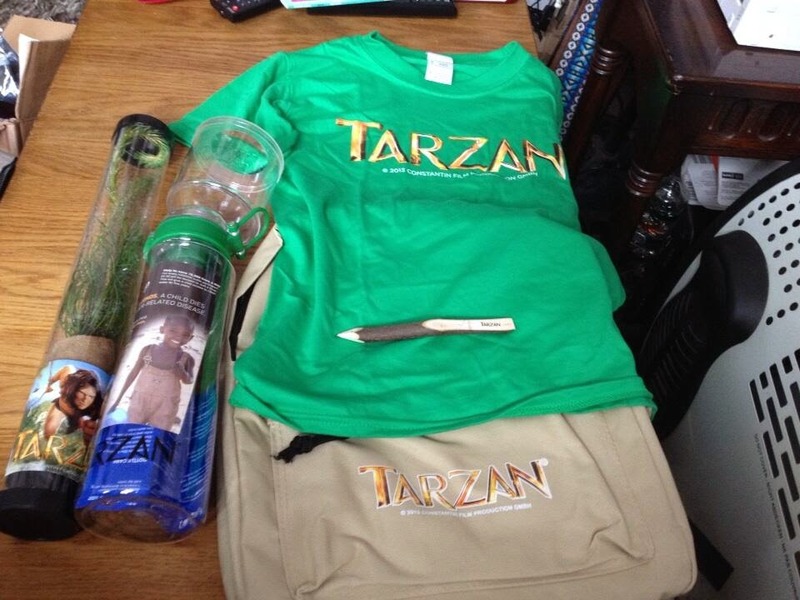 And finally I won a fab Tarzan Goody bag from @CultboxTV on twitter. The goody bag includes a kids t-shirt (which will go to one of my nieces/nephews), a rucksack, a magnifying glass bug catcher, a stick pencil, a water bottle and a tree sapling. It's cool that it includes a tree. I am hoping to plant it out in a pot in the yard and see if it grows. The water bottle is cool too it has a filter in it. It's been fab coming back to these great goodies in the post. I also received two Mega Boxes of OMG! which I plan to do a post about and a competition to win one in the next week so keep an eye out for that post. 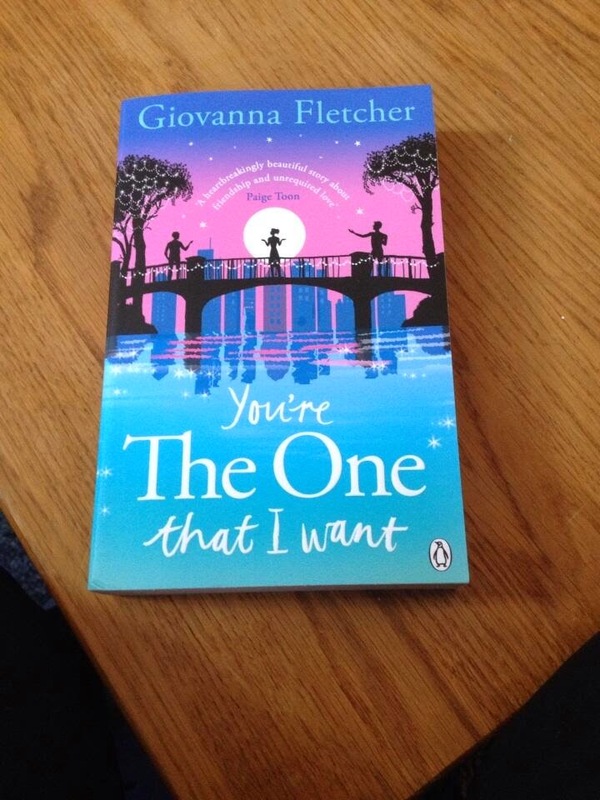 Box of Chocolate Topcorn and Signed copy of of 'You're The One That I Want' by Giovanna Fletcher.